I worked on creating this front as a bit of fun and thought someone may find it useful so am releasing it into the public domain as a free LCD number font set. The fonts are supplied as a fully editable EPS document and can be used in any print, digital or other application. 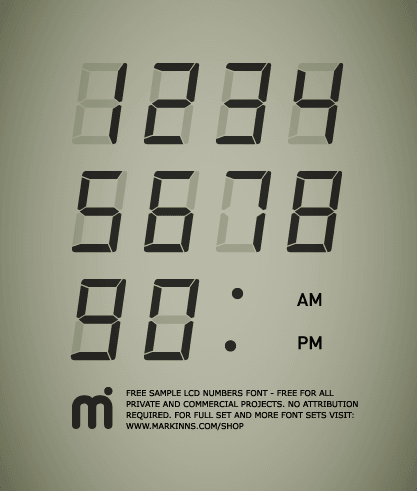 Preview of the free sample LCD Numbers front. The download the file will open with your preferred vector editing application. Files have been saved as legacy format and will work in all versions of Adobe Illustrator CS3 and above. This free sample may be used for any purpose you see fit be it for personal or commercial use. There is no obligation to provide attribution when you use this free sample but a link back to www.markinns.com is always appreciated. We like to get feedback on our products so if you use this in your designs why not leave a comment below to give others inspiration.